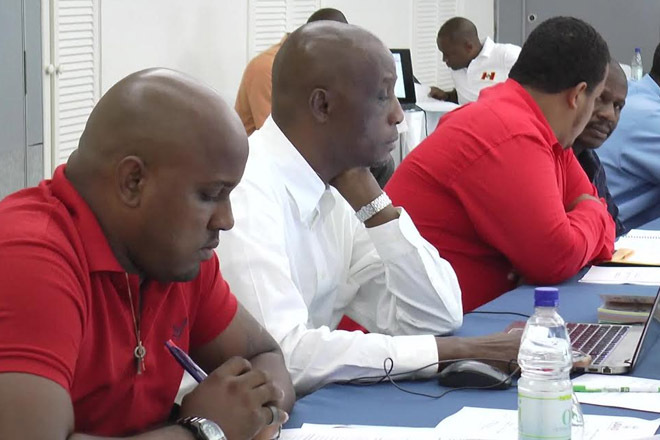 (ZIZ News) — First responders from across the region are in St. Kitts for a three-day Hazardous Materials Training Workshop hosted by the USAID Office Of Foreign Disaster Assistance for Latin America and the Caribbean in collaboration with NEMA. One of the main facilitators, Fire Station Officer Abdias Samuel said the workshop is of critical importance to the region. “We are creating an awareness level…and our intention is to ensure that first responders in particular have the idea or the knowledge and the necessary skills to be able to respond in a way that is safe to them and the citizens. Its critical because this is one of the areas that we are weak on in the region and based on the analysis done by experts, they say this is one of the areas we need to build capacity on,” he said. District Medical Officer and Health Disaster Coordinator in St. Lucia, Dr. Glensford Joseph said he was satisfied with the level of training at the workshop. “With the knowledge so gained here today, it’s improving our awareness and improving our ability to better plan to manage the incident that may encompass hazardous material. I am pleased so far with the lecturers/ facilitators in the way they deliver the material, ensuring that we understand and I hope that by the end of the workshop I’ll be better informed and be able to respond more efficiently and effectively,” he noted. Fire Officer at the Dominica Fire and Ambulance Service Grenfel Defoe said he will be able to use what he’s learned on the job. “As a fire officer daily we come in contact with hazardous materials and we need to be able to understand the best way to deal with the situations so that is my role here; to educate myself and also when I go back I can educate others”, he said. The workshop was attended by professionals from across the region including doctors, environmental specialists, fire fighters, police officers and persons from the Community Emergency Response Team (CERT). The workshop is taking place at the Ocean Terrace Inn from July 26th to 28th.